You are currently browsing the tag archive for the ‘PrepareUs’ tag. Do you have a well-stocked disaster bag? Yesterday was the one year anniversary of the Japan earthquake and tsunami. Re-watching the footage from that disaster reminded me, again, how vulnerable we all are to a natural disaster. And last Monday, my own little house was jolted by an early morning earthquake. Now, this one was only a 4.0 and nothing even fell of a shelf, but the first thing I thought was. Why do I still not have an earthquake kit??? This task has been on my to- do list for months, if not years. I’ve downloaded lists, I thought about all the places I need to go to collect the supplies; target, REI, the hardware store. I’ve heard the stories, I have a family to protect, and yet I still have yet to cross it off my list! Well, now I have no excuses! 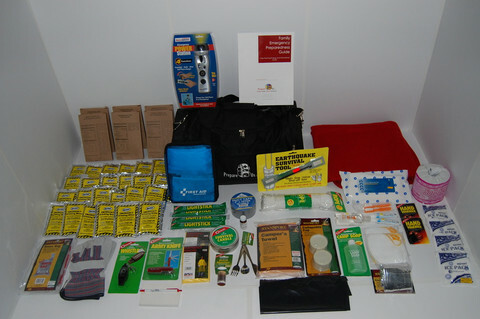 I have been introduced to PrepareUs, a local company that sells disaster preparedness bags. These bags come with everything you need to survive after a natural disaster and I mean everything (Full size toilet paper anyone??). Not only do you get a well stocked bag, but a full step-by-step guide to help you prepare for a disaster, no more wondering what you should or need to do, its all spelled out for you here. One more thing really sets these PrepareUs bags apart. Their unique refill system. They will automatically alert you if anything in your kit is about to expire and replace it, at cost, insuring you are always up-to-date and never have to think about your disaster kit again! The guys at PrepareUs have put together a list of helpful tips to ensure our families have the ability to anticipate and conquer in any unplanned event. With 7 things, break it down to one task a day and you’ll be prepared for anything by this weekend! Make a List: Take 5 minutes and just think – if there were a disaster right now, what would you do? What would you grab? What are your top 5 must grab items in the house? Plan: Become familiar with your children’s school evacuation plans and make a plan that works for your family so that you all know where to go, how to reach each other, and what each one expects from one another. Write this down for each person and stow it in a safe place that is always near. (i.e. a wallet or backpack) Make a plan with babysitters and let them know where you expect them to go in case they have to evacuate you are not able to get home. Backup: Make sure you back up and keep extra copies of important data such as computer files, birth certificates, passports, and other items you feel necessary on either an external hard drive or online cloud server. Educate: Look up your local red cross shelters, find the local radio stations that you can tune into for information in case of emergency, and find the local 911 dispatch number to directly call local dispatch instead of a general 911 operator. Also learn how to turn off your water and gas lines. Supplies: Make sure you have a Go-Bag with enough of the essential supplies: food, water, sanitary items, and any medications needed for each person in your family to last for a few days; keep one in your home, along with smaller versions in your car and/or office. Pets: We all know that pets are members of the family, so don’t forget about them! Be sure to keep extra food and water to sustain them for a few days as well.